Contin has something for everyone who comes here. From a lovely flat, short trail and picnic benches under tall pines, to tough uphill climbs and long views over Strathconon. 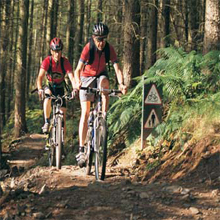 You can ride a forest road to Rogie Falls, or go foraging in quiet groves of native birch and oak. The forest stretches on for miles and is home to roe and red deer, red squirrels, butterflies and birds.